Perfect Delivery Certificate – delivered! Posted April 8th, 2019 | News. 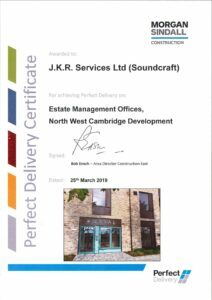 We are proud to have received the Morgan Sindall ‘Perfect Delivery’ Certificate, which arrived at Soundcraft’s offices in Kent to acknowledge our work on a complete fit out of the Estates Management Office in Cambridge. To find out how Soundcraft can assist you with your next project, please call our UK technical and sales helpline on 0800 988 1875, email technical-sales@soundcraft-doors.co.uk or request a call back.